Wearing ear protection is necessary when hunting, or any time you fire a gun. Basic ear plugs will save your ears from damage, but electronic ear protection is even more safe. Check out which electronic hearing protection we recommend for hunting. Having hearing protection from gunshots is essential on any hunt, but unfortunately this creates another danger. Jamming your ears up with ear plugs will make it harder for you to communicate with your hunting partners. Good communication is absolutely necessary to ensure maximum safety on a hunt. You need to know where your partners are at all time. Fortunately, electronic hearing protection solves this problem. By allowing you to hear what is going around you while also reducing the damaging sound of gun shots, you get the best of both worlds. This allows you to protect your ears while maintaining situational awareness. An added bonus is these headsets can boost ambient noise so you can better hear and track wildlife. If you are in a hurry, our choice for the best electronic hearing protection is the Howard Leight by Honeywell Impact Sport Sound Amplification Electronic Shooting Earmuff. Click the buttons above for detailed information about each unit, or read on for our review of each of the top 3 electronic hearing protection sets. Our top choice for the best product in this review is the Howard Leight Impact Sport Shooting Earmuff. This hearing protection is one of the most used products for shooting and hunting. Between the low cost, the feature-packed design, and the great ratings, this is an all-round great choice. The Howard Leight Impact Sport by Honeywell was first and foremost designed for safety and ear protection. The earmuffs come with a noise reduction rating of 22, which is more than sufficient for protecting your ears from gun shots while hunting. Another feature that makes this product safe is the built in sound amplification system. Microphones in this ear protection pick up sounds and amplify them to 82 dB, so you can be more aware of what is going on around you. It is important to be able to hear and communicate with your hunting partners, for everyones safety. Also, the noise amplification process will make it easier to hear and track wildlife. One feature that we really like about this headset that really makes it great for hunting is the low profile body design. Not only is it light-weight and comfortable enough to wear on an all day hunting trip, the slim profile will not hinder your shot, no matter what weapon you are using. 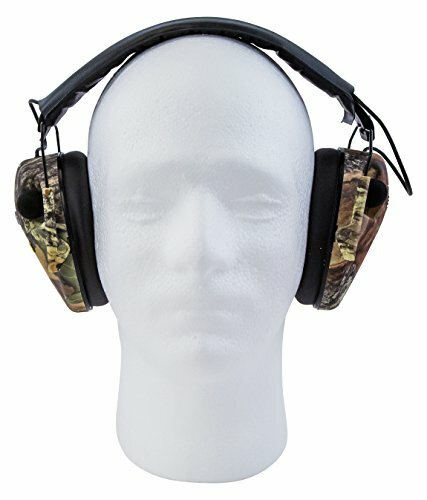 If you need some entertainment to pass the time waiting in a hunting blind, these earmuffs include an input for headphones. So you can listen to your favorite tunes or listen to a podcast while you wait for your prey. This is a very durable and long-lasting product. We have heard reports of buyers using them for several years and still being effective. As well, they last a long time on one set of batteries, with a battery life of up to 350 hours. The headset also includes an automatic shut-off after 4 hours so you don’t have to worry about forgetting to turn them off. Not only are the impact sport earmuffs one of the best rated hearing protection systems, but they are also the most rated. Over the years, this headset has earned over 12,000 ratings, with an average of 4.5 stars. Product testers and customers had an overwhelming positive response to this ear protection, saying things like “simple to use and comfortable”, “I would highly recommend these”, and “dirt cheap and work very well”. 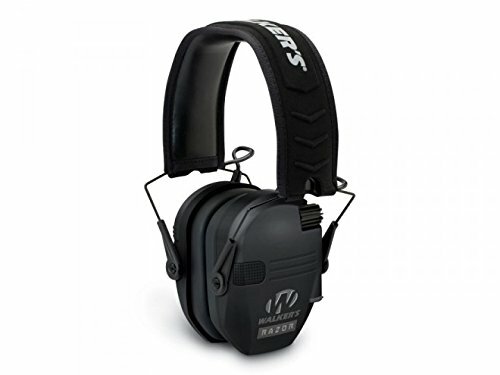 Overall, the Howard Leight Impact Sport Earmuffs are the best electronic hearing protection in this price range, and they can be had at an excellent price. The 2nd best option in our roundup of electronic hearing protection for hunters is the Walker’s Razor Slim Electronic Muff. This product is tied for the highest hearing protection rating and has the most features, all though it is the most expensive product in our list. The sound on this headset is superior to any other in this price range, with full dynamic range high definition speakers. Even noise reduction rating is very high on these at 23dB reduction rating, they still make it easy to hear what is going on outside the muffs with omni directional microphones that quickly bring sound to your ear with just a .02 second delay. Standard on this model is the ridged on/off volume control, that makes it easy to adjust even when wearing gloves. Also included is an audio input jack that allows you to listen to music. This headset is powered by AAA batteries and has a very long battery life. The Razor Slim Electronic Muff by Walker is another highly rated hearing protection unit. With an average of 4.5 stars over almost 1,000 reviews, this is obviously a well liked product. People who purchase these had things to say such as “they are fantastic!” and “did not disappoint”. The Walker’s Razor Slim Electronic Muff is a great product, although the slightly more expensive price is something to consider. 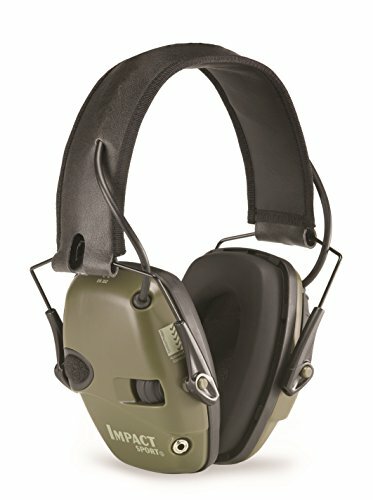 The last set of hearing protection to make out list is the Caldwell Low Profile E-Max Electronic Ear Muffs. Coming it at the lowest price in this review, this headset is an excellent budget choice for the money conscious hunter. All though this is an extremely low priced unit, it is still good enough to get the job done. The main purpose to wear hearing protection is to protect your ears, and the Caldwell Ear Muffs do that well. They are rated at a 23 NRR, which means they are more than enough to protect your ears from loud gun shots while hunting. The main mechanism for protecting your ears is through the microphone shut off system that activates when sound is above 85 dB. One of the nice features of this model is the 2 microphone audio input, which creates a true stereo with one microphone on each ear. The Caldwells are also have a low-profile design, so they won’t interfere with your shooting. While not as well rated as the other hearing protection in this list, the Caldwell Low Profile E-Max Electronic Ear Muffs were still well-liked by product reviewers. People who bought this model said that it was a great value, although some people expressed concern over it not lasting as long as expected. But the crazy low price makes up for the lower quality. – When wearing ear protection, make sure it fits correctly to ensure maximum safety to ear drums. A loose fitting headset can let noise in. – The seal of the cup should not be broken or interfered with in any way. Make sure there is nothing that sits between the seal and your head, such as hair or glasses. If the seal should break, get it repaired or get a new headset before using. – Inspect headset before every use for cracks or faulty pieces. As you should know, firing guns without ear protection is extremely dangerous. We strongly encourage you to wear something, even if it is just basic earplugs. If you have need for other hunting gear, make sure to check out some of our other product reviews.